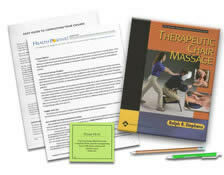 Do you have the Therapeutic Chair Massage textbook? See your enrollment options above for "I already own the text". Based on a textbook by Ralph Stephens, this course provides key conceptual preparation and encouragement to seek additional hands-on training in seated massage, and reviews core elements that will benefit experienced seated massage practitioners. Through text, photos, case studies and sample forms, explore an expert’s recommendations for equipment, communication, documentation and body mechanics. As a FREE bonus, the textbook also provides detailed instructions and photos for numerous seated massage routines, however this course does not teach any hands-on skills. Please seek additional experience, with a mentor, to add hands-on skills. You have made it very easy and efficient to complete CEUs and I will definitely come back. Thank you so much, it was an amazing exam which helped refresh my memory. The book is very interesting and easy to read. It is educational even for an experienced LMT, with great tips for protecting my hands during chair massage! Thank you! The book "Therapeutic Chair Massage" by R. Stephens is one of the best massage books out there. I learned things that are important for table massage as well chair massage. I enjoyed this course. It was really very helpful since I do seated massage as often as possible. Thank you! The combination of having a book sent and allowing an online test and online certificate works very well. I will try your courses again next year. Good refresher for seated massage. Very helpful. Met my requirements with new material. Thank you for being there. The questions were only for the first 6 chapters of the book. There are 13 chapters. So that was strange. The book is very interesting and easy to read. It is educational even for an experienced LMT, with great tips for protecting my hands during chair massage! Thank you! This course gave me a good refreshers from what I learned from my initial schooling. It will greatly help me in giving a better massage to my clients. This course exceded my expectations. This class was more through then the other chair massage classes I have taken. The text book was phenomenal. This course was very easy to read and understand. The references and pictures provided valuable details to fully understand the content. I can use all the knowledge presented in this course in my massage practice. Very easy to study. Gained knowledge reading the material provided. Although I no longer do chair massage, there was so much very informative, technical, and valuable information for anyone interested in doing chair massage. It has proven a valuable modality for marketing, promotion, benefit massage, specific special situations, quick fixes, and “thank you” massage. I recommend this for a complete massage package! The information presented in this course was very informative. I came away with a greater knowledge of chair massage and how to better serve my clients while minimizing the possibility of injury to myself. Such a great course for those looking for information about starting a chair massage business. Definitely got me thinking about incorporating chair massage into my massage business. I have been wanting to learn Chair massage. In school I learned some basics and wanted to know more. The book is very informative and shows many photo illustrations to aid in proper body mechanics. The only thing I would say is missing is an actual DVD to match the course material. Good info and this is something I will be incorporating into my practice. The chair massage course had an excellent book. I will definitely use this in my practice. It was very important to hear "take care of yourself so you can take care of others" It's easier said than done. I was also grateful for the information on personal wellness program and all the information on self care. Define “seated massage” and identify its benefits compared with table massage. Identify the essential elements recommended for choosing seated massage equipment. List the essential elements for effective client intake and assessment in seated massage. List the essential elements for effective treatment planning and documentation for seated massage. Identify the recommended body mechanics for performing seated massage. Recognize at least 4 ways to use posture, movement and breathing to prevent therapist injury.